Oil on canvas, 98 x 86 cm. With a calm, contemplative expression on her face, the Virgin Mary holds the naked Christ Child, who has his right arm around her neck. 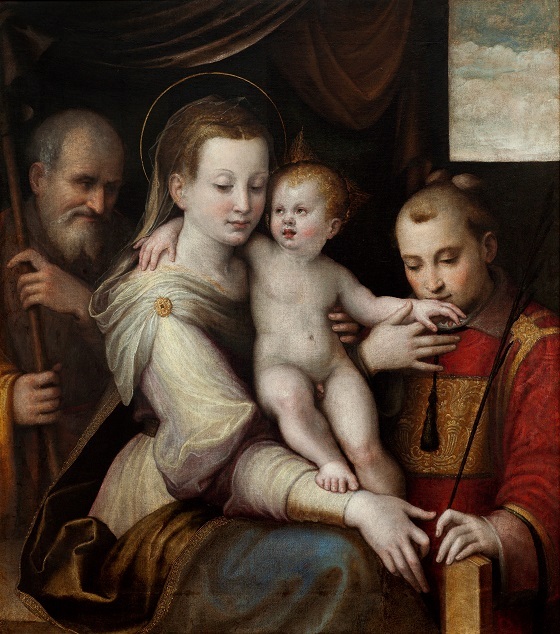 In the background, Joseph sees the love shared between mother and child, while a saint displays his reverence for the Holy Family by kissing the child’s left hand. The stones on his head tell us that the man is St. Stephen, traditionally venerated as the first martyr of Christianity. St. Stephen was accused of heresy for preaching the Gospel and was sentenced to death by stoning by the Jewish authorities. A curtain in the background forms a natural frame for the scene, while cloudy skies can be seen through the window. The combination of the symmetrically divided group of figures and the well-balanced variation between warm and cold shades of colour lend the scene a harmonious character, clearly influenced by the style of the Venetian school.